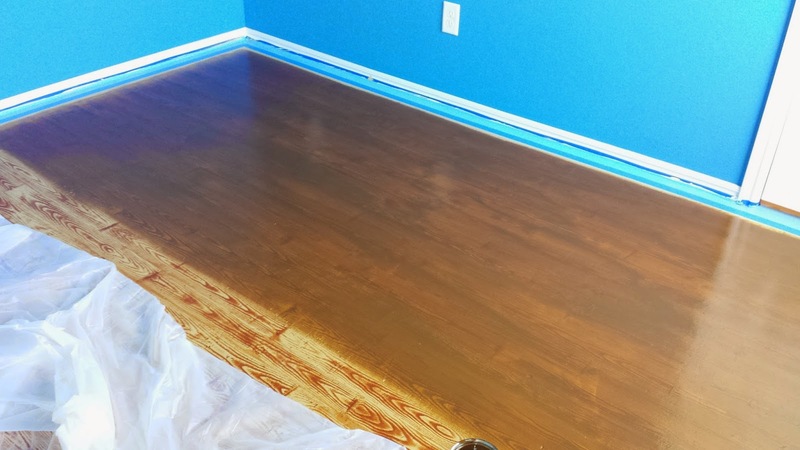 Following along with us as we paint the upstairs flooring to our new house. It's a work in-progress and we're excited to take standard particleboard plywood and turn it into something we can be proud of. Join us and watch how it all unfolds! We have a new home! Check out our new website for all the information about our DIY Home Improvement Projects! With the hard part out of the way, your plywood should start to resemble a hardwood court, but it's much too high in contrast. The wood grain is definitely there, but it's a little overbearing at the moment. 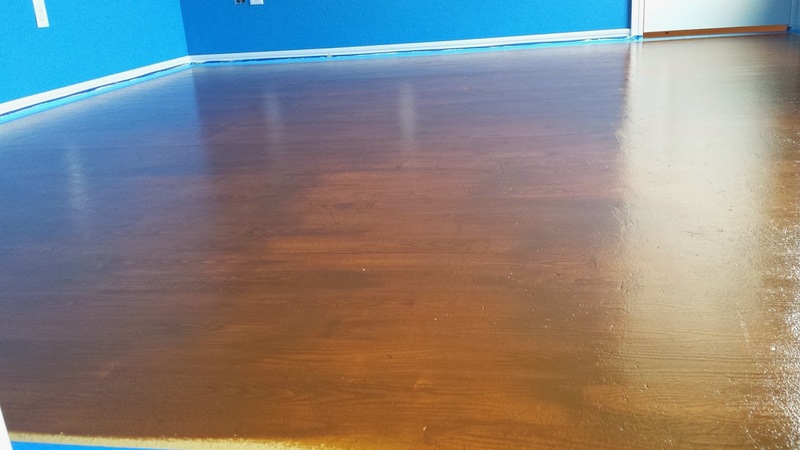 Let's take care of that by adding a wood stain, the final color of the court itself and something to bring all the steps together. Gel stain applied...time for the final color! I chose to paint sections at a time, separating the planks individually. I felt that this would give me a nice, subtle variation in color to make the planks look separate, as opposed to painting a large section at a time. It may have taken a little longer as a result, but I think the final product turned out much better because of it. You can still see the subtle wood grain coming through the stain, and slight color variations giving it a more natural look. We were all really excited to see the results of all of our work, and within a few more minutes, we had a finished floor! Admittedly, toward the end I started to cheat and did larger sections at a time. As it dried, the color variations became more subtle, but for a time, it stood out where I had stopped with each pass. I would advise patience in your project to get the most consistent results possible. Congratulations on making it this far! 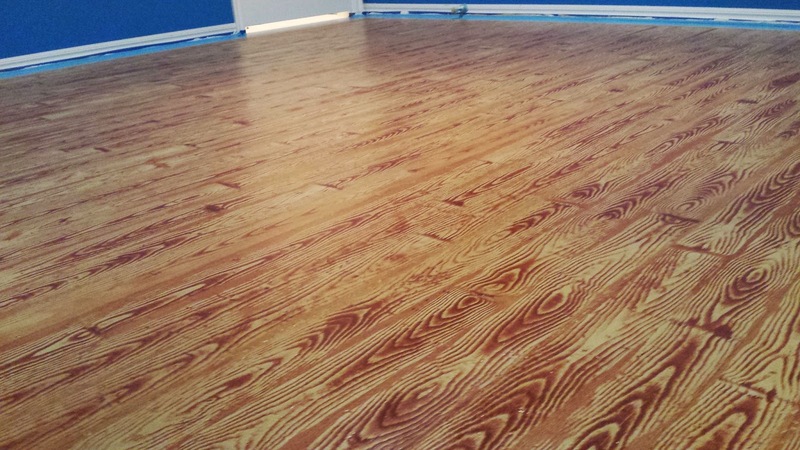 You have a pretty realistic hardwood floor, and if that was all you were going for, then your work is finished! Start applying polyeurethane and call it done. But we're not finished...in fact, we're just getting started. In our next step, we'll step setting the groundwork for our court lines and bring this basketball court to life! very beautiful larch plywood, if you need the larch plywood, please contact me.